Not to be confused with Roman Catholic Diocese of Armenia. According to an 1842 article by C. W. Russell in The Dublin Review there were 150,000 Armenian Catholics worldwide. Malachia Ormanian, a historian and an Armenian Apostolic Patriarch of Constantinople, counted 135,900 Armenian Catholics worldwide: 84,500 (62%) in the Ottoman Empire, 30,000 (21%) in the Russian Empire, and 21,400 (16%) elsewhere, mostly in central Europe. 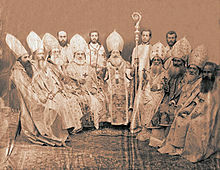 The 1897 imperial census in Russia found 38,840 Catholic Armenians, while 1914 Ottoman government statistics provided 67,838 as the number of Catholic Armenians. According to Annuario Pontificio, the annual directory of the Holy See, the church had 142,853 followers worldwide.[when?] The number rose to 736,956 in 2015 according to the same source. The 2011 census in Armenia there were 13,247 Catholics (of any ethnicity) in the country. ^ Ormanian, Malachia (1911). Հայոց եկեղեցին և իր պատմութիւնը, վարդապետութիւնը, վարչութիւնը, բարեկարգութիւնը, արաողութիւնը, գ��ականութիւն, ու ներկայ կացութիւնը [The Church of Armenia: her history, doctrine, rule, discipline, liturgy, literature, and existing condition] (in Armenian). Constantinople. pp. 259–267. Wikimedia Commons has media related to Armenian Catholic Church.